I can’t overestimate the importance of The Legendary Cuisine of Persia. There are so few books on the culinary history of Iran although it has had a profound effect upon the foods of so many eastern countries as well as the Mediterranean diet. 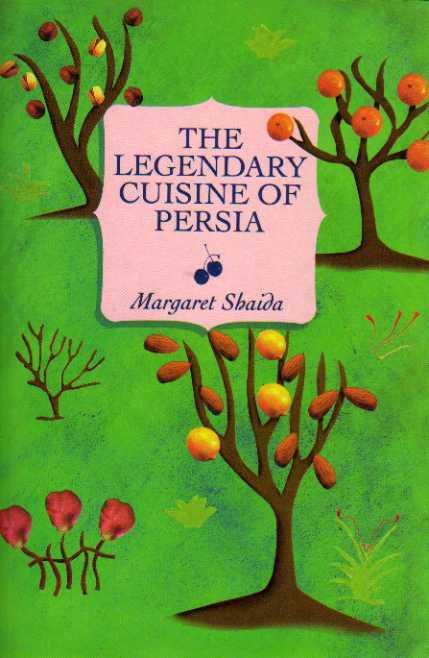 Margaret Shaida, the author, was born in England but moved to Iran when she married. She lived there for 25 years and learned to cook from her mother-in-law, friends and other family members. At first glance you might find it difficult to see the relevance of Persian cuisine in modern Europe but there are a few clues to its impact. The Old Persian bâdangân became al-badinjan in Arabic, alberjinera in Spanish, and finally aubergine in French and English. The word Spanish has its origin in the Old Persian espenj, orange came from nârang, lemon came from limoo. The Moghuls (Mongols) invaded Persia and adopted the language, cuisine and religion of their new land. Two hundred years later Tamerlane, a direct descendant of Genghiz Khan, set his sights on India and took with him the traditions of the Persian court and kitchen. Biryani is the Persian word for baked, nan was introduced to India by the Persians and was baked in a tanoor which later became a tandoor. It’s certain that India has changed the original Persian dishes and made them her own. They might have the same names but they are spicier now. The recipes are divided by type with a chapter on bread being first. This might seem strange but bread has an almost mythical importance even in the modern Iranian home. It’s never wasted or allowed to fall to the floor. Left-overs are made into breadcrumbs rather than being thrown away. There are delightful recipes here. They have subtle and aromatic flavours rather than being hot with spices. Rice dishes are held in high esteem but poorer families might only eat these on festival days. Rice with Herbs (Sabzi Polow) is perfumed with parsley, coriander, dill and chives. Rice with Dried Fruit and Nuts (Ajeel Polow) is substantial and delicious with minced lamb, crisp fried onions and dried cherries. Kebabs are now familiar to us in the west. Margaret Shaida offers us a mouth-watering selection all of which will be more succulent and tasty than the dodgy examples found in late-night take-aways from Brighton to Beijing. Lamb Fillet Kebab is delicate and tender and you’ll notice the difference. Pickles are traditionaly a big thing in Iranian homes so Margaret has included several interesting ones. Pickled Shallots are easy to produce although a bit time-consuming. Make large quantities of these and you’ll have something different to offer guests. Try them and you’ll agree they are worth the effort. It’s always tempting to just jump directly into the recipes in cookbooks. Don’t do that with this book. You’ll miss so much fascinating information. Claudia Roden has said “…the background and history of the food is both a joy and a precious contribution to the world of gastronomy.” If you have a serious interest in food then you will find this book enchanting.